Powered by up to 8th Gen Intel® Core™ i7 processors and NVIDIA® GeForce® GTX 1070 GPUs, Acer Nitro 50 Series desktops offer performance that exceeds the needs of casual gamers and can easily handle graphics-intensive tasks. Sleek and stylish, the new Acer Nitro VG0 and RG0 series monitor both earned 2018 Red Dot Design Awards. They feature AMD Radeon™ FreeSync[i] and up to a 1ms Visual Response Boost™[ii] to deliver smooth and tear-free gameplay. 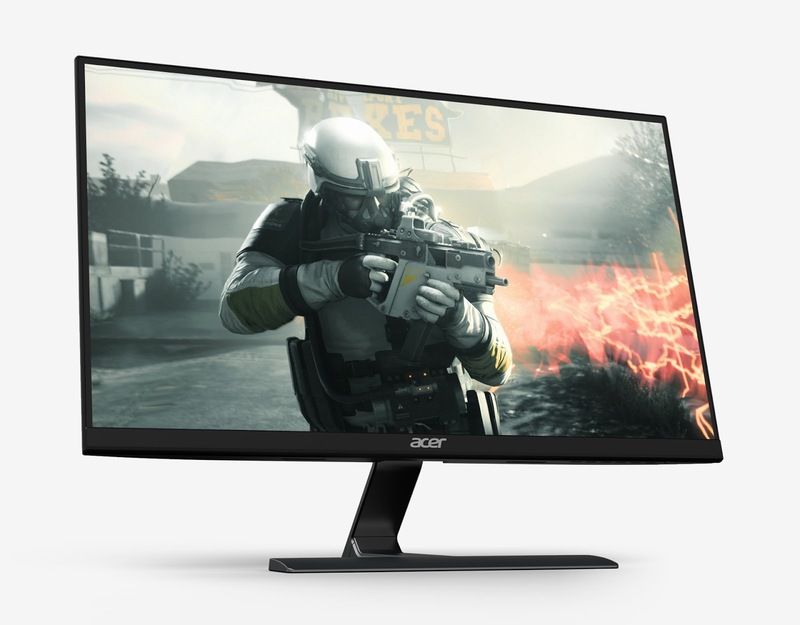 Acer unveiled new Nitro Series gaming desktop PCs and monitors that expand its Nitro product family, designed for outstanding casual gameplay at affordable prices. 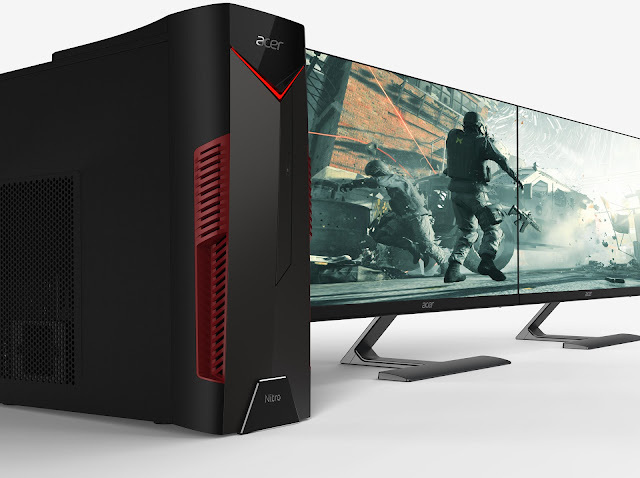 The new Acer Nitro 50 Series desktops and Nitro VG0 and RG0 Series monitors easily handle demanding processing and graphics requirements for both content creation and consumption. 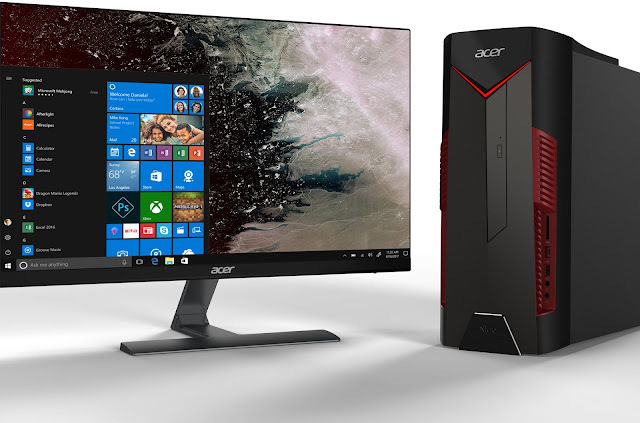 Acer created the Nitro 50 Series for those seeking the processing power and capabilities only a desktop PC can offer. These performance PCs are powered by up to 8th Gen Intel® Core™ i7 processors and equipped with up to NVIDIA® GeForce® GTX 1070 GPUs to deliver superior performance for graphics-intensive tasks including gaming. They deliver stunning 4K resolution visuals and can support up to four displays[iii] simultaneously for immersive gameplay. With up to a 3TB HDD and a 512GB SSD, there’s no shortage of storage. They sport a handy wireless charging deck[iv] for keeping users’ Qi-enabled wireless devices powered up and ready to go. To top it off, the Nitro 50 series features striking and edgy armor-inspired housing with front-facing LED lighting that emits a sinister red glow. Lastly, the Nitro 50 desktops optimize network speed for gaming, browsing, and streaming through Realtek Dragon LAN. For totally immersive entertainment or to transform the gaming experience into an eye-popping stereoscopic experience, just match the Nitro 50 desktop with an Acer Nitro VG0 or RG0 monitor. These new IPS[v] monitors with AMD Radeon™ FreeSync1 satisfy gamers’ need for speed with a blazing fast response time of up to 1ms Visual Response Boost (VRB) for smooth gameplay without breaking the bank. The Acer Nitro VG0 series is available with 27-, 23.8- and 21.5-inch panels delivering true-to-life color, and resolutions of 4K UHD, WQHD or Full HD. The ultra-thin Acer Nitro RG0 series boasts a sleek .27-inch thin profile and is offered in 27- and 23.8-inch models. Both models feature the sophisticated but functional design that has earned them 2018 Red Dot Design Awards. Boasting AMD Radeon™ FreeSync, the new Nitro monitor’s frames sync with the graphics card’s frames to eliminate screen tearing and minimize lag, allowing for smooth gaming. Integrated Visual Response Boost™ (VRB) decreases blur in fast-moving images to achieve the effect of a 1msMPRT, along with up to 144 Hz refresh rates. Integrated 6-axis color adjustment lets gamers fine-tune color, hue, and saturation to best suit the game at hand, while built-in black boost enables gamers to select from 11 black level options to optimize visual advantage and clearly spot enemies, duck for cover, or navigate curves on a race track. The new Nitro RG0 series’ 1920x1080@75Hz resolution delivers excellent visual detail and is perfect for 1080p Full HD gaming, multimedia, and productivity applications, including Blu-ray Disc console gaming and widescreen cinematic playback. The IPS panels provide accurate views even at wide angles of up to 178 degrees horizontally and vertically. For optimum viewing angles, the monitors can tilt from –5 to 20 degrees [–5 to 15 degrees for RG0 series]. Meeting 72 percent of the NTSC standard and delivering a 250 cd/m2brightness, Acer Nitro monitors produce vibrant colors and images. Two 2W stereo speakers4 deliver quality audio and HDMI, VGA and DisplayPort ports4 connect to a wide array of PCs to support powerful sound effects. Integrated Acer Game Mode has eight pre-set display modes to optimize visuals depending on the type of content being displayed. Display modes include Action, Racing, Sport, User, Standard, ECO, Graphics and Movie. Settings are easily accessed through a hotkey or the On Screen Display (OSD) settings menu. Acer VisionCare encompassing Flickerless, BlueLightShield, ComfyView and low-dimming technologies enhance viewing comfort during long gaming periods. Outfitted with a VESA mount, the monitors can be hung on a wall to free up desk space, leaving more room for game sticks, mice and more. In addition, a ZeroFrame design maximizes viewing area and supports near seamless multi-monitor setups. 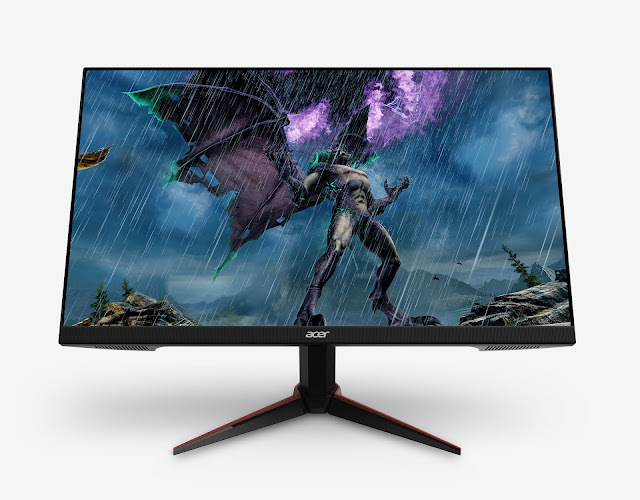 The Acer Nitro VG0 series monitors will not be available in South Africa. The Acer Nitro RG0 series monitors will not be available in South Africa. The Acer Nitro 50 series desktop will not be available in South Africa. [ii] 1ms VRB value based on internal tests under specific test conditions. Level of brightness may vary as a result of VRB mode in use.